In 2015, as part of my "year of adventure", I travelled to South Korea. During my time there, I had to trek to the infamous border shared with the North; the most heavily fortified in the world. I took two tours – the public DMZ tour as well as a private tour of South Korean military bases led by a former General. It was one of the most fascinating, memorable experiences of my life. A moment spent witnessing modern history and a good lesson on the effects of war that hopefully don't escalate in the present day. Because of recent escalations, I thought I would post a throwback that hopefully provides a bit of insight into what it's like to travel there. Links to my past writings and a gallery of images are below. To view pictures of Korea, click here. Not much gives me stress when I travel. There is always the chance of getting lost but I see that as an adventure. There is always the chance of not being able to communicate but I've always been able to connect. There is always the risk of getting sick, but … it hasn't happened yet (knock on wood). The food in South Korea is absolutely phenomenal and diverse. Probably the best cuisine I've had outside of France. Menus are primarily in hangul, which makes it difficult to know exactly what you are getting, but this didn't pose a problem; the perfect blend of spice and sauce in every dish made me forget – or perhaps ignore – whatever the specific ingredients were. My favourite place to eat was a hole-in-the-wall near the Lotte Hotel. I'd visit every other day as it was delicious and, more importantly, affordable. Cost of sustenance was the only thing I was unprepared for during my holiday. Seoul is not a cheap place to dine out. Even street food, located in trendy shopping districts and full of impulse buys, was costly. The first few days I was concerned with how my lack of planning (and restraint) would affect my travel budget but then I decided to just screw it. You only live once and when in Seoul, you must eat the mystery meat. And the milky-textured soda. And the "poop" bread. Sounds gross, but everything was seriously delicious. Every day I would walk roughly 30km around Seoul. The same distance a soldier would have to hike during training while carrying 30kg of weight on their back. I would often find myself carrying a haul of beauty products found only in Korea. This is another industry that the nation is keen to become a world influencer in. Plastic surgery is very commonplace (the New Yorker even cites South Korea as "the world capital of plastic surgery") but it isn't the overtly-obvious type found in North America. In comparison, it is characterized by very subtle refinements and enhancements done by some of the most skilled surgeons on the planet, most of which have offices in Seoul's most affluent district, Gangham. I wasn't here for this purpose though. My nose, eyes and breasts are exactly the same since I was a teenager and shall remain as such, for better or worse, until I die. As someone who spends entirely too much money in Sephora though, I was interested in their beauty products. This is where I was introduced to the power of … snail secretion. Asia has a lot of strange beauty rituals. I can't personally vouch for all of them (just wait for my upcoming Japan posts), however, I will state that the women are beautiful and their skin is FLAWLESS. This is what I desire. A lifetime of acne-scarring, crater-sized pores, and living in an unpredictable, harsh climate has made me seriously self-conscious about my largest body organ. While in Seoul, I bought everything – and I do mean everything – in an attempt to fix this or at least fool myself into thinking so for a few hours. Cleansers made from colloidal glacial clay, BB creams, "essences" of things I can't pronounce. There were also masks of all types containing everything from lemon to mugwort to pearl, and for every body part from the face to lips to feet to certain unmentionables. The one that curiously produced results for me was a facial mask described as including "snail slime extract to calm the skin and help improve skin damage". It's bananas. My skin glows. I don't know what I'll do when I run out, but it may be cheaper for me to book another ticket to Seoul than to waste further funds in my local mall. I didn't just leisurely walk this pedestrian-friendly city, I also hiked above it. Within Seoul's massive perimeter lies the world's most visited national park: Bukhansan. A few transfers on the subway from the main business district brings one to an ecological paradise that rests in stark contrast to the hustle-and-bustle of the city that surrounds it. At first I was a bit lost when trying to find the entrance but then realized that, yes, I did have to walk through an active freeway construction site in order to get to it. Of course. Development can't be – won't be – stopped. Amidst lush flora, trickling waterfalls and spectacular rock formations, I hiked over 123 stories (according to the health app on my iPhone) until finally reaching a Buddhist temple perched on one of the park's peaks. There was a lot of activity. A corporate retreat was underway; as well, a lot of Seoulites make this pilgrimage daily. They appeared to do it with relative ease. Whereas I regularly needed time to catch my breath amidst the wheezing, they motored through with purpose and dignity, wearing appropriate clothing and using trekking poles to wisely balance weight. I didn't even have a bottle of water and was woefully unprepared for just how "intermediate" this intermediate trail was. But I made it. The view at the top and feeling of achievement was well worth it. I lost my grip and stumbled on a particularly steep portion of the trail on the way down. A woman in front of me came to ask if I was okay; or at least, that's what I assumed. She didn't speak English and I didn't properly learn Korean. Sincerity is a trait that cannot be faked though. She offered me some bread and we continued the descent attempting to communicate via other means. She pointed out interesting rock carvings that I previously missed and showed me where natural, drinkable water sources were located. At the base, we went our own ways but when I later hopped on the crowded subway to return to my hotel, I felt a tap on my shoulder. The same woman I had shared my afternoon with was also riding at that moment. I was happy to see her again. In lieu of a common language, I used images to express my love of her hometown, showing her some of the pictures I had been taking during my time in Seoul. She seemed pleased by this. As her stop approached, she smiled warmly and gave me an embrace. I knew in this city of 25 million – and this world of 7 billion – that I would probably never see her again, but she gave me a memory that I would carry forever. That is the purpose of travel. A strawberry festival was on during my time in Seoul. This is a delicious strawberry latté (©Deborah Clague/Oblada.com). This was one of the most memorable moments of my trip. I happened to be walking by Bosingak (a historic bell that signalled the opening and closing of the ancient city gates) just before noon and noticed a number of people congregating for the bell ringing ceremony. I entered and watched as a number of children got to participate. After the penultimate chime struck out, we were all asked to surround it and place our hands overtop of its massive surface. As it was hit one final time, the reverberations echoed through my entire body. It was like nothing I had ever experienced before. 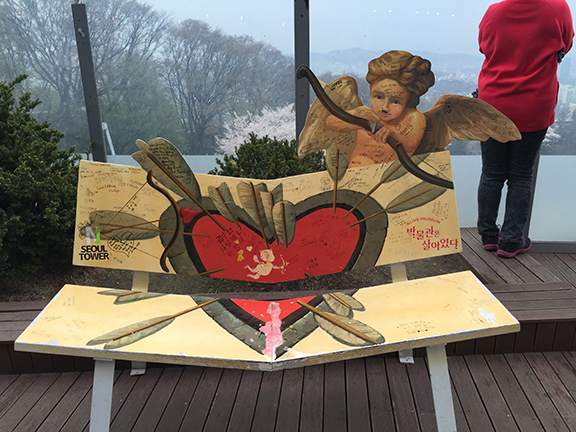 Love benches atop Namsan, where shy lovers are forced to get closer (selfie sticks are HUGE in Korea) (©Deborah Clague/Oblada.com). Do a Youtube search on any k-pop artist and you will find hundreds of similar videos of the western youth demographic marvelling at the detail put into these pieces. Videos that don't actually play any of the artists' music; just focus on the presentation and the thrill of being immersed in a brand. This is the power of good design. I walked the streets of Dongdaemun taking photographs of signage and street art and the Design Plaza when an older gentleman passed me on a bicycle. I smiled as I stepped aside to give him the breadth of the sidewalk, then resumed my focus on framing shots that I wanted to capture. As I continued on though, I heard the distinct sound of spokes slowly turning behind me. The bustling ambiance of the area could not cloak the feeling I had that something was amiss. I purposely kept pausing to confirm that someone was following me and my gut instinct proved correct; the older man on the bike was shadowing my every step. I stopped and pretended to be immersed in my phone and he finally went by only to turn around a few yards ahead. As he cycled towards me, glaring, he spoke something in Korean. The tone in his voice was distinctly unwelcoming. It was the only time during my travels through Korea in which I felt unease. Watching TV in my hotel room late one night, I came across what appeared to be a reality dating show. I don't normally watch this type of programming but what the couple was doing caught my interest. I previously read about the offbeat coffee shops in Seoul, but while they seemed fun, I'm not really a coffee drinker. I am, however, a huge lover of canines. The dating show had a couple visit The Bau Haus and so I also decided to make an afternoon of it. I arrived early hoping to avoid a crowd but I was too late. A line-up of giggling schoolgirls stood ahead of me excitedly talking about the dogs they were about to see. I assumed they came here often; they had their favourites. As living space in Seoul is quite small, this is a way for locals to share their love with a pet without owning one. The schoolgirls counted down the seconds for the doors to open (10, 9, 8 …) and when they did, ran inside claiming several tables. I staked a seat, climatized to the odour of 40 or so dogs, and before even looking at the menu, had a wee chihuahua climb onto my lap, curl up into a ball and fall asleep. I eventually ordered a 7,000 WON (approximately $7.00 CDN) cookies-and-cream milkshake and took in the action. Guests are provided a listing of all the dogs at The Bau Haus, including their name and age. My newfound friend was Sa Tang, a one-year-old long-haired chihuahua. During my time in the coffee shop, I noticed that this breed seemed to be drawn to me. I had an endless parade of them climbing onto my lap and seeking a cuddle. When one of the resident corgis kept approaching, Sa Tang would awaken from slumber, growl and chase him away. "Ooh…he is very jealous." observed a tourist from England seated next to me. I wondered how Monty would take this new development. "Are you from America or Canada?" "Canada." I replied. I find it interesting when people ask me this (before hearing me speak), as it is never a consideration that I could be from anywhere but North America. I am never mistaken for someone from England (my father's lineage) or France (my mother's) or perhaps Russia or Australia or Italy. My appearance is squarely North American, whatever that means. "I have been to Vancouver and Calgary and Toronto." The stranger proceeded to take out his Samsung smartphone and show me pictures of his travels through the Great White North. He seemed to appreciate my homeland. Even its notorious weather. We discussed travel for a bit until the subject seemed to get stuck on the attributes of Malaysia. "You should visit Malaysia." he repeated to me. If he said it any more, I would have believed that he was attempting hypnotism. "I've never really thought about it, but I'll consider it." He shared more pictures on his smartphone that depicted various sights in Kuala Lumpur. The only one I recognized was the twin towers. I am, admittedly, unfamiliar with the country. As he scrolled through, he stopped at an image and asked me what it was. "That's the CN Tower." I stated confidently. "No it is not. It is the KL Tower. You must never confuse the CN Tower with the KL Tower. You need to visit Malaysia." After being scolded, I couldn't tell if this guy was hitting on me or involved in a really weird guerrilla marketing experiment for beleaguered Mayalsian Airlines. The Bau Haus is located near exit 3 of Hapjeong Subway Station in Seoul, Korea. For more information, click here. The full impact of this obviously does not come across via a low-res Youtube video but let me assure you, when the curtain rose, I swore Psy (and 2NE1 and Big Bang) were standing in front of me. I'm not sure when this technology will become commonplace in North America, but I look forward to it. It blew me away. I also visited the Dongdaemun Design Plaza, a unique epicentre of design and the creative industries where global citizens can learn about and experience the latest trends and knowledge pertaining to the field. The fluid, ultra-modern architecture alone was stunning but the numerous art halls, design labs and experience zones situated within it's graceful curves also provided a much needed jolt of inspiration. My takeaway is that Korean design aims to be fun, fearless and revolutionary and its scene is one that will be a major global influencer for decades to come. Samsung, one of Korea's biggest brands with over 305 billion dollars in revenue and nearly half-a-million staff, has a showcase in their head office in Gangnam. Open to the public, Samsung d'light offers hands-on interaction with their latest and upcoming products and technology – it is a digital playground for early adopters. I was greatly intrigued by their educational and home life displays, while the ultra HD 4k televisions left me in awe. I'm not really one for watching TV and playing video games, but I could have spent all afternoon doing this there. Alas, there was so much more to see and do in Seoul. Like go to a dog café. Klive, the hologram concert hall, is located on the ninth floor of Lotte Fitin shopping complex in Dongdaemun, Seoul, Korea. For more information and admission prices, click here. Dongdaemun Design Plaza is located across the street from Lotte Fitin shopping complex. For more information, click here. Samsung d'light is located near exit 8 of the Gangnam Subway Station in Seoul, Korea. For more information, click here. Not a lot is known about the mysterious land of North Korea. The few visitors/tourists that travel to the hermit kingdom get a very regimented, limited frame of reference, one that is pre-approved and paints the nation and its dictatorial leadership in the most flattering light. Author Suki Kim spent six months there under the guise of being a Christian English teacher employed at Pyongyang University of Science and Technology (PUST), academic home of North Korea's young elite. In this book, she speaks candidly of the monotony of day-to-day life, the motivations of the Christian missionaries who were her colleagues, as well as the naive, auspicious nature of her beloved students. One definitely gets a sense of the claustrophobic environment in this oblique country; it's hard not to feel paranoid that someone is also watching you while reading this. Favorite line: "One by one, they rushed up to me to ask the same things. The news consumed them. The story of how a boy wizard had only been an abstraction for them, and they could not believe that they would actually get to see a movie based on it. For them, the lure was not so much the storyline, of which they knew virtually nothing, but the fact that the rest of the world had seen and loved it, that it was a true blockbuster. This unexpected chance to join the Harry Potter bandwagon made them feel included in a world that had always been denied to them." Western media has painted modern Russia as a lawless, corrupt society led by a ruffian. This book implies that the portrayal isn't entirely false (the general motto of the country could be "not legal, but fair") but that there's so much more to its enigma than we know. What is life like for the average Russian – a group of people forced to pave their existence through omnipresent crisis and upheaval? Well, they're not entirely different from anyone else in the world just trying to get by with perhaps an added emphasis on consuming alcohol in quantities that have decreased the average life expectancy and a habit of "duality", a phrase which the author uses to describe the Russian wont of sending conflicting messages. The most interesting part of the book for me was reading about the treatment of women in this militaristic society that nurtures and encourages the macho, crude, aggressive male stereotype. With eleven million more females than males in the Russian population, this has led to an imbalance of power and equality that trickles down from competition to securing a mate to police response on domestic violence incidents which aren't viewed as a violation of human rights. Favorite line: "Soviet schools forced kids to memorize the great Russian poets, especially Pushkin. I have often wondered what good it's done them. You cannot expect many farmers in Mississippi to quote Whitman, while you can expect every farmer in Krasnodar Krai to recite you a verse of Pushkin or to pick their favourite from among Chekhov, Dostoevsky and Tolstoy. Surely there must be some appreciation for language and for beauty, and there must be something worthwhile in the fact that there are all of these texts that the whole nation shares – poems, fairy tales, great social novels, absurdist short stories … all these shared prisms to see the world through. And yet, in comparison with the stability of the West, with our lack of shared literacy reference points, everything in Russia is governed by degrees of chaos. Is there something about wide-scale appreciation for art that leads to chaos?" The Korea photo gallery is now updated. Click here to view. The first batch of retouched images from my trip to Korea have been uploaded into a gallery. It's amazing how far smartphones have come; all were taken with an iPhone 6. Please click here to view. "I'm a designer. I create print and web materials. I wanted to visit South Korea to experience the creative culture that your government is actively promoting and hopefully be inspired once I return to Canada." "Ooh. Good job. Very good. You will find a lot to see and do while here. Are you married?" "Ah…how come? We do something about this. You need a strong Korean man. I will get you one." For the remainder of the day, my tour guide attempted to set me up with members of the military. Under normal circumstances, I would have been annoyed and embarrassed by this affront to my sense and sensibility but in this instance I was greatly amused. Even though I was on the adventure of a lifetime, experiencing things that few have the opportunity to, the topic of conversation always veered to when someone would put a ring on it as though my validation in life derived from it. Throughout the trip, I felt my father's spirit always with me. After this exchange, I felt my mother was also in the room. Driving to Seoul from Incheon Airport at dusk, the hangul signage began to illuminate the streets. It's a beautiful alphabet. I tried to decipher what they were communicating through other visual cues, but I couldn't identify anything. This just made my trip more of an adventure. I yearned to get lost in this neon safari. Above this, at the apex of the increasingly vertical skyline, I noticed the light of Christian crosses glowing red. Their ubiquity a sign that the United States army wasn't the only group attempting to stake their interest and convert ideology in this foreign land. "Do you think reunification will happen during your lifetime?" I asked this question to several people during my time in South Korea. The defector I met. People who've lost family members. While everyone expressed desire for reunification to occur, the short answer I received from everyone was the same. The perceived motive of the war amongst South Koreans also generated a unanimous response. "This is just a war between super powers. First, soviet Russia and capitalist America and now China versus the west. If this were to be settled amongst Korea, we would be united by now."